Magh Navratri, or Gupt Navratri, is observed Shukla Paksha (waxing phase of moon) of Magh or Magha month (January – February) as per the traditional Hindu calendar followed in North India. In 2019, Magh Navratri begins on February 5 and ends on February 14, 2019. Magh Navratri is dedicated to the nine forms of Shakti – Hindu Mother Goddess. The Navratri rituals are followed mainly by women in the Hindi speaking states in India. Magh Navratri is also known as Gupt Navratri. The rituals and forms of Shakti worshipped during Magh Navratri vary from region to region. 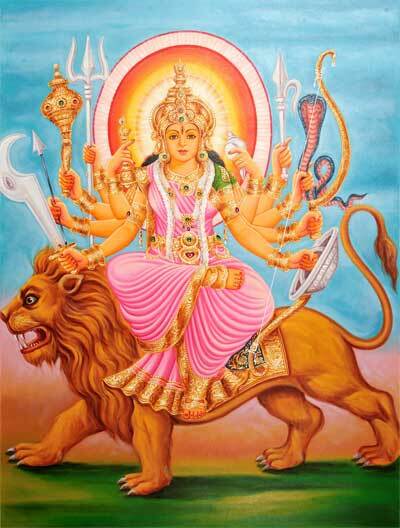 In some regions, it is noted for a nine-day community worship of the nine forms of Shakti. Gupt means secretive and the puja and rituals are performed to obtain Gupt Siddhi (secretive powers) by Tantrics. Dasa Mahavidyas are invoked during the period by adept tantrics to obtain various Siddhis. The ritual is more widely practiced in certain regions in North India. Fasting is observed on certain days of Magh Navratri and strictly vegetarian food is consumed during the period. Gupt Navratri is also observed during Shukla Paksha of Ashada (June – July). Two of the most famous Navratris are the Chaitra Navratri and the famous Navratri held during (September – October). The mantra should be chanted daily in the morning. It should be chanted on a Rudraksha Mala having 108 beads. 11 mala should be completed in a day - 11 X 108 times. The mantra should be chanted after offering lamp, dhoop, chandan, red flowers and white peda or white sweet to Goddess Durga. Chanting of the mantra will help in achieving peace and prosperity in life. How to Do Magh Navratri Puja? The puja is to be performed in northeast corner of the house. The devotee should wear green color clothes. The murti (painting, sculpture or photo) of Durga should be place on a green color cloth. A bronze lamp should be lit using cow ghee. One wick is preferred. Tilak should be of gorochan. Mishri or kalkanda or rock sugar should be offered. The bhog or prasad on the day should made of til and moong - usually a khichadi is prepared. It should be distributed among family members, relatives and neighbors after puja. The mantra ह्रीं दुं दुर्गापरमेश्वर्यै नमः should be chanted 108 times using a mala during the puja. Wearing gorochan offered to Goddess Durga during Magh Navratri on forehead daily will help in improving intelligence. Offer 6 supari to Goddess Durga and later bury it in a deserted place. This will help in victory over enemies. Donate fruits to poor people during the period to get relief from a serious illness. Puja, fasting and rituals during the period should be secretive as per followers of the puja. The reason for performing puja during the period should not be shared with anyone. The more secretive you are the more early you will have your desire fulfilled.